This is somewhat challenging for a kid to put together. 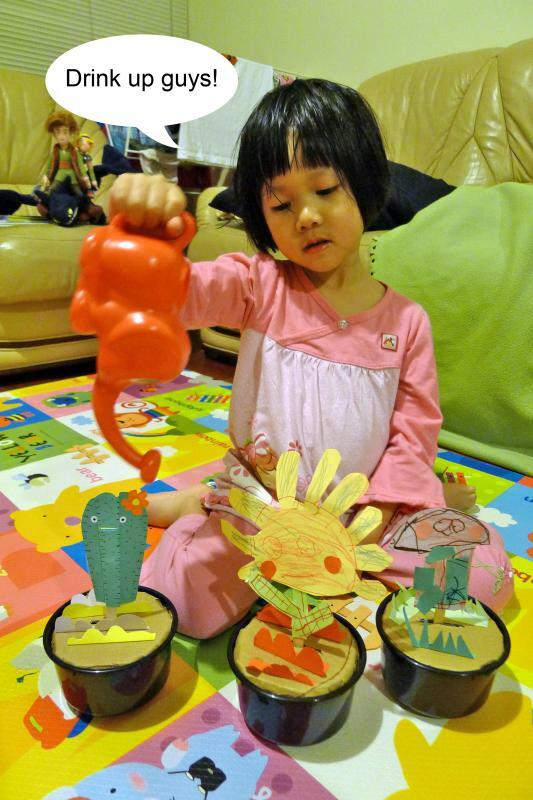 What kiddo does get to do are the beginning and end bits. The crucial bits have to be done and put together by an adult, hence I’ve decided to categorise this here. Need to make a ‘soil’ cover to hide the mechanism of the happy potted plant. 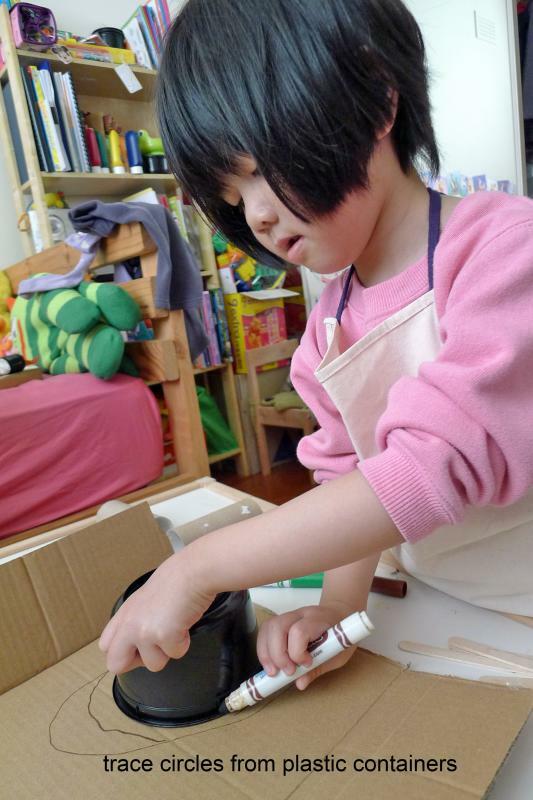 Get kiddo to trace the shape of the opening of the container. The shape should be the same shape as the opening and must be trimmed at the edges to fit the container later. 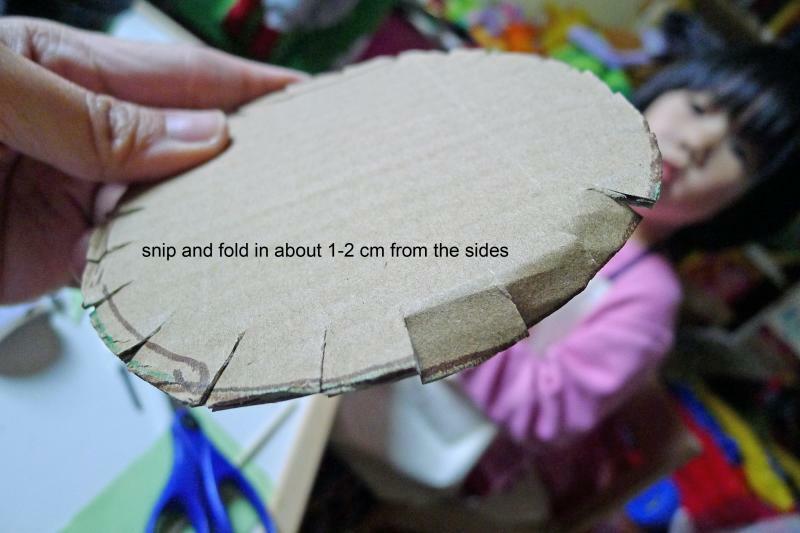 Make an approx 3 cm slit in the centre of the round cardboard. 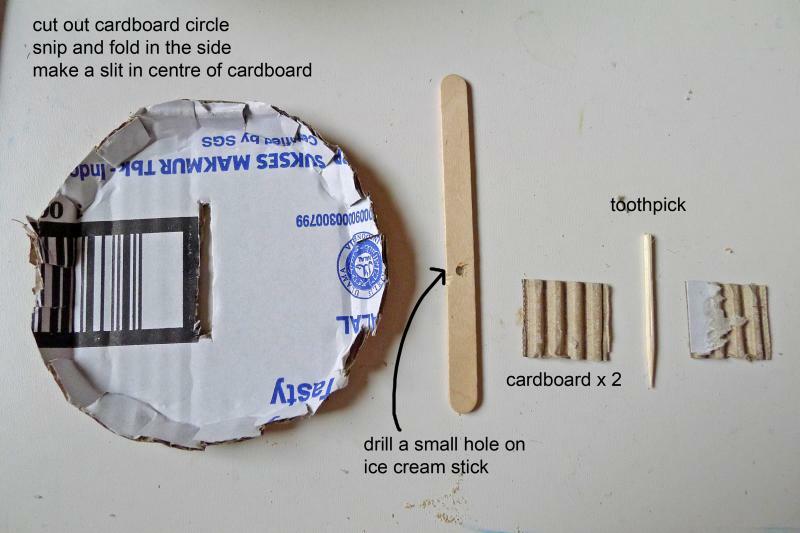 Drill a hole on the ice cream stick with the small screwdriver. The hole should be slightly off centre. 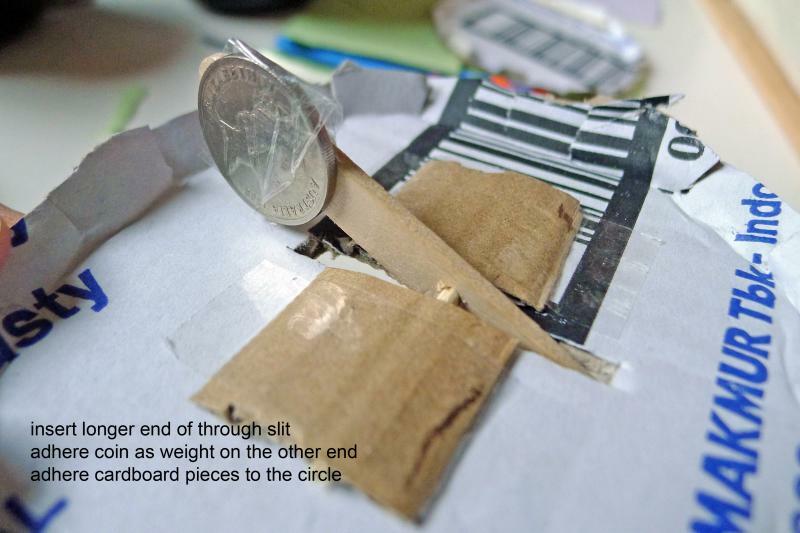 Cut 2 small pieces of cardboard and trim down a small piece of toothpick/food stick. The following is the main mechanism that allows the plant to move. The toothpick/food stick should be able to rotate freely within the ice cream stick. Slot in the ends of the toothpick/food stick into the grooves of the cardboard pieces. The toothpick/food stick should be able to rotate freely within the grooves. Adhere the cardboard pieces to the under side of round piece. 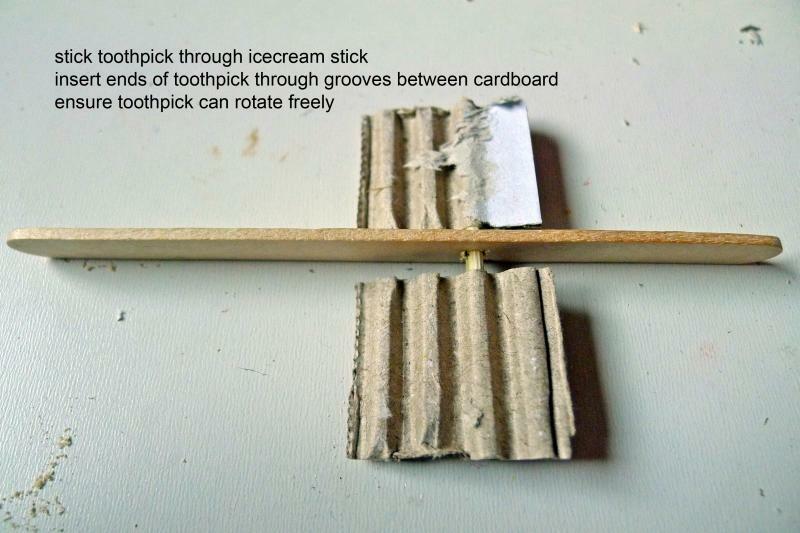 Attach a coin to the shorter end of the ice cream stick as a ‘pendulum’ weight. 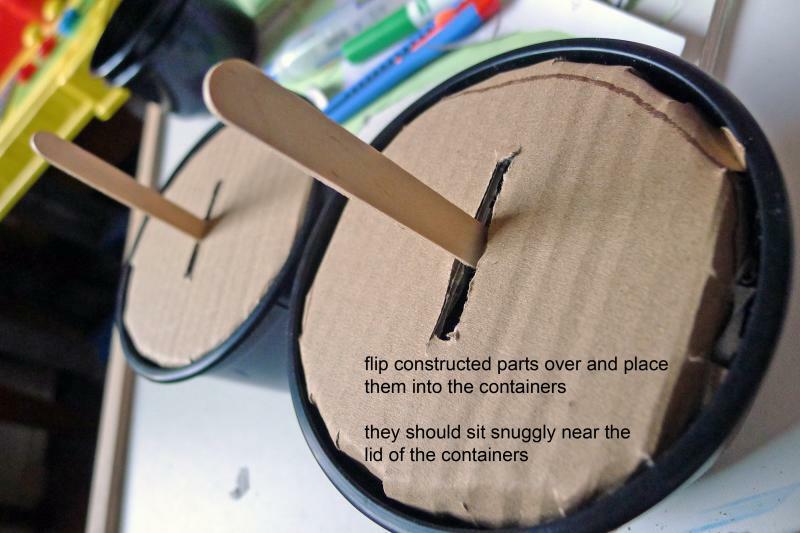 Turn the mechanism around and place it over the container. It should fit nicely and the ice cream stick should stay perpendicular to the ‘pot’ and sway when tapped lightly. 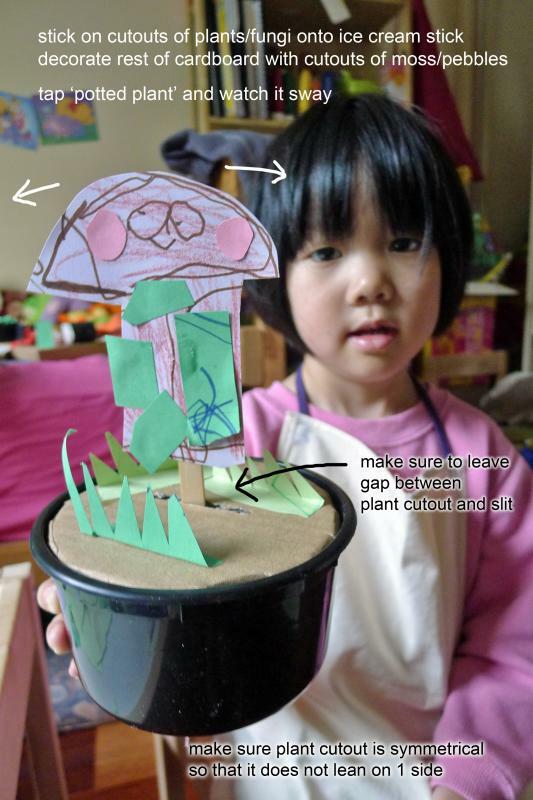 Last but not least, the kid now gets to draw, colour, cut and stick on her plant. In this case, she decided to make a purple mushroom. BUT the plant has to be symmetrical so that it stands upright at rest. Suggest to kiddo that bits of pebbles and grass may be added too.